This necklace is really very interesting. We can't put our finger on just what kind of stone it is carved out of, if indeed it is stone. They are very cold to the touch. If indeed they are carved! They have a certain primitive style about them. They remind me of some fetish style neclaces I have seen. Approx. 30" long. The shipping fees quoted are forf priority/No insurance in USA. 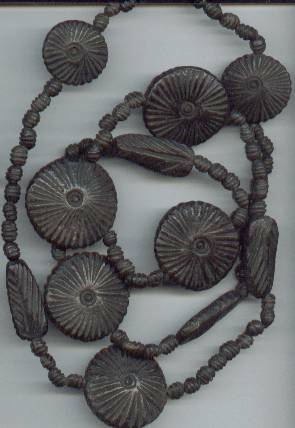 Items Similar To "Necklace/?Stone/Primatively Carved Style "